WHO IS PATRICIA PATTYN ? Originally from France, where my university studies led to teaching French as the mother tongue and English as a second language in school settings, I quickly realized that I had a passion for teaching adults, especially helping those seeking to enter the job market. It was a natural transition when I arrived in Quebec 25 years ago to establish Le Parilangue, which has evolved into L’Institut Patricia Pattyn, IPP. Over the years, I developed a practical familiarity with a wide range of professions, including Engineering, Accounting, Architecture, Real Estate, and others, but decided to specialize in Health and Social Services. In 2006-2008, as a Project Manager, I have designed and taught an advanced intermediate level course in oral communication for nursing and social work students at McGill University for a Training and Development of Human Resources pilot project, financed by Health Canada. The goal of this pilot project was to better prepare students for practising their profession in a Francophone milieu. In 1997, I accepted my first contracts for English to French professional translations. Since then, my translation work has included consent forms, research proposals, and various other documents for researchers and administrators working in Health and Social Services. In 2015, I translated into French, a document whose original title was Guiding Family Caregivers of People at the End of Life – a Handbook. My vision and intent is that to be well translated, a message must translate not only the words, but the meaning behind the words. In conclusion, Mastering French matters! Other than my numerous individual and group classes in the Health and Social Services sector, you will see below some of my additional accomplishments as an author or translater. Author: Cahier d’exercises, Cours de communication orale, Université McGill. (2006 – 2007) Textbook produced as part of the Training and Development of Human Resources pilot project. 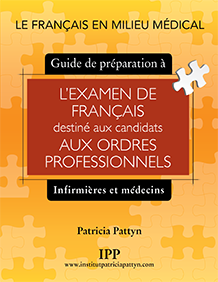 Co-author: Grammaire française plus en contexte, santé et services sociaux, Volumes 1 et 2, Université McGill. (2006 – 2008) Textbooks co-produced for a 6 credit written expression course, as part of a Training and Development of Human Resources pilot project. Translator: Guider les proches aidantes de personnes en fin de vie. (134 pages). 2015.